Christopher Columbus' expedition from Spain made landfall at the Bahamas, in the Caribbean; he believed he had reached East Asia. E. Delporte discovered asteroid #2913 Horta. The first free flight of the French "piggy-back" aircraft concept used to get a ramjet up to speed where it would function took place. The "First Symposium on Space Flight" was held at the Hayden Planetarium in New York City. The First Symposium on Space Flight was held at the Hayden Planetarium in New York City on 12 October 1950. Participants included Wernher von Braun, Joseph Kaplan, Heinz Haber, Willy Ley, Oscar Schachter, and Fred L. Whipple. Among the topics discussed were an orbiting astronomical observatory, problems of survival in space, circumlunar flight, a manned orbiting space station, and the question of sovereignty in outer space. The Von Braun rocket, space station, and Lunar lander designs presented were popularized in a series of articles in Colliers magazine in 1953, illustrated with Chesley Bonestell paintings. Goethe Link Observatory discovered asteroid #1728 Goethe Link. USSR launched Voskhod 1 (call sign Rubin/Ruby), the first ship to carry more than one person into space at a time. With the launch, there were three people in space simultaneously for the first time. Voskhod 1 (call sign Rubin/Ruby), the first mission to carry a scientist and a physician into space, was launched 12 October 1964. It was the first flight without space suits, and the first capsule with more than one seat, carrying three men into space. The Soviet mission was specifically planned to beat the US Gemini program to this milestone. The crew members were cosmonauts Vladimir M. Komarov, command pilot, Boris B. Yegorov, physician, and Konstatin P. Feoktisov, scientist, an engineer who had been part of the Sputnik and Vostok design teams. A potentially dangerous modification of the Vostok capsule to upstage the American Gemini flights, Voskhod had no spacesuits, ejection seats, or escape tower: There was no provision for crew escape in the event of a launch or landing emergency. One concession in the design was a backup solid retrorocket package mounted on the nose of the spacecraft. The seats were mounted perpendicular to the Vostok ejection seat position, so the crew had to crane their necks to read the instruments, which were still mounted in their original orientation. This mission was designed to test the new multi-seat spacecraft, to investigate the capacity of a group of cosmonauts who were specialists in different disciplines of science and engineering to interact and conduct physical and technical experiments, to perform an extensive medical and biological investigation program for evaluation of medical findings on a prolonged flight, and to test the soft-landing apparatus and shirtsleeve cabin environment. Live TV pictures were also returned to Earth from the capsule during the flight. Officially, the life-support systems of the space cabin were felt to be reliable enough to allow the crew to wear overalls instead of the cumbersome spacesuits and helmets. In reality, however, there wasn't room available in the cabin for a crew of three in spacesuits, so the equipment was foregone in order to carry the larger crew. The 16 orbit mission was a success, and a large amount of scientific data was obtained. The world's first recovery of an orbital spacecraft with its crew aboard on land was made possible by a rocket package suspended above capsule in the parachute lines, which ignited just prior to impact in order to cushion the landing. Coming before the two-man Gemini flights, Voskhod 1 had a significant worldwide impact. In the United States, the space race was again running "under the green flag." NASA Administrator James E. Webb, commenting on the spectacular mission, called it a "significant space accomplishment." It was, he said, "a clear indication that the Russians are continuing a large space program for the achievement of national power and prestige." NASA and the USAF launched X-15A Checkout mission # 152 in which Pete Knight achieved a maximum speed of 5002 kph (Mach 4.62), and a maximum altitude of 28.773 km. The flight ended prematurely because of an APU (auxilary power unit) shutdown. USSR launched Soyuz 7 (call sign Buran/Snowstorm) from Baikonur, the second of three Soyuz launched in as many days, to perform maneuvers with the others on a mission with flight objectives the same as for Soyuz 6, except that no welding would be done. Soyuz 7 was launched 12 October 1969, one day after Soyuz 6. On board were cosmonauts A. Filipchenko, Commander, Flight Engineer V. Volkov, and Research Engineer V. Gorbatko. The ship was involved in group flight with Soyuz 6 and Soyuz 8. Soyuz 7 was to have docked with Soyuz 8 and transferred crew while Soyuz 6 took film from nearby. The planned docking did not occur because the rendezvous electronics failed in all three craft due to new helium pressurization integrity tests conducted prior to the mission. Soyuz 7 landed 5 days after launch. The announced mission objectives included (1) checkout of the Soyuz craft, (2) further improvement of the control, orientation, and orbital stabilization systems and navigation aids, (3) debugging the piloting systems by orbital maneuvering of the spaceships in relation to one another, (4) testing of a system for control of the simultaneous flight of three spacecraft, (5) scientific observations and photographing of geological-geographical subjects and exploration of the Earth's atmosphere, (6) studying circumterrestrial space, and (7) conducting experiments of engineering research and biomedical importance. Stable two-way radio communications were maintained between the spaceships and the ground stations, and TV coverage was broadcast from the ships during flight. With the launch of Soyuz 7, there were five people in space simultaneously for the first time. V. Piksaev discovered asteroid #2094 Magnitka. The US Navy launched the TIP 2 (Triad 2) navigation satellite from Vandenberg, California, a prototype of an improved Transit satellite which also tested a pulsed plasma engine. P. Wild discovered asteroids #2175 Andrea Doria, #2429, #2565 and #3026. Purple Mountain Observatory discovered asteroid #3340. USSR launched three Glonass navigation satellites (Cosmos 1413, 1414 and 1415) from Baikonur on a Proton booster, testing components and equipment of the space navigation system being built to locate Soviet civil aircraft and merchant and fishing vessels. E. Bowell discovered asteroids #2985 Shakespeare and #3714. The US Navy launched the Nova III navigation satellite from Vandenberg, California, an improved Transit satellite propelled by a pulsed plasma engine. An Ariane 44L launched from Kourou carried the SBS 6 and Galaxy 6 commercial communications satellites to space, which were initially positioned in geosynchronous orbit at 97 deg W, and 91 deg W, respectively. The NASA High Resolution Microwave Survey (HRMS) began a decade of planned observations to search for signals of extraterrestrial intelligent origin with inaugural ceremonies at two sites - Goldstone, California and Arecibo, Puerto Rico. 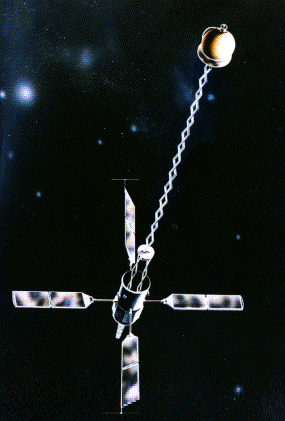 Germany's DFS Kopernikus 3 communications satellite was launched on a Delta booster from Cape Canaveral, Florida, and positioned in geosynchronous orbit at 31 deg E 1992; 23 deg E 1993-1999. NASA's Venus orbiting Magellan mission ended as the satellite's orbit entered the upper atmosphere of Venus and contact with the spacecraft was lost after over 4 years of mapping operations. Helmut Hoelzer (27 February 1912 - 12 October 1996) was a German rocket avionics expert. He began studies at the Technische Hochschule Darmstadt, but lost his scholarship in 1933 after getting into an argument with a Nazi student organization. After teaching, he returned to Darmstadt and was able to complete his degree and was employed by Telefunken in Berlin. He was recruited by Werner Von Braun to work at Peenemuende, and arrived there in 1939. He worked there on developing the V-2 guidance system and the Messina telemetry system. Following World War II, he became a member of the German Rocket Team in the United States, and worked the remainder of his life with the rocket team, at Fort Bliss, Texas, White Stands, New Mexico, then at Huntsville, Alabama. As of 1960, he was Director of the Computation Division at the NASA Marshall Space Flight Center. Hoelzer died at Huntsville, Alabama. During the 6h 4m STS-112-2 EVA, Atlantis astronauts Wolf and Sellers continued installation activities of the International Space Station's S1 truss. China launched its second manned space mission, Shenzhou 6, from the Jiuquan Satellite Launch Center, with a crew of Fei Junlong and Nie Haisheng. Crimean Astrophysical Observatory discovered asteroid 2013 TV135, initially estimated to have a 1 in 63,000 chance of Earth impact on 26 Aug 2032. 2013 TV135 is an asteroid estimated to have a diameter of 450 meters (1,480 ft) when it was discovered. On 16 September 2013, it passed about 0.0448 AU (6,700,000 km; 4,160,000 mi) from Earth. On 20 September 2013, it passed perihelion (closest approach to the Sun). The asteroid was discovered on 12 October 2013 by the Crimean Astrophysical Observatory using images dating back to 8 October 2013. It was discovered by Ukrainian astronomer Gennady Borisov with a 0.2-meter (7.9 in) telescope. Its orbit, with an orbital inclination of only 6.7 degrees and an orbital period that spans almost four years, carries it as far out as about three quarters of the distance to Jupiter's orbit and slightly closer to the Sun than the Earth's orbit (0.99 AU). On 16 October 2013, with a short observation arc of 7 days, 2013 TV135 was listed on the JPL Sentry Risk Table with 1 in 63,000 chance of impacting Earth on 26 August 2032, giving the asteroid a Torino Scale rating of 1. The peak estimated threat occurred 19-20 October 2013 when Leonid Elenin and NEODyS estimated the odds of impact to be 0.03% (1 in 3,800). On 31 October 2013, NEODyS estimated the odds of impact to be 1 in 4,330 and the Sentry Risk Table estimated the odds of impact to be 1 in 6,250. On 7 November 2013, with an observation arc of 25 days, the Sentry Risk Table estimated it had about a 1 in 169,492,000 chance of an Earth impact on 26 August 2032. It was removed from the JPL Sentry Risk Table on 8 November 2013 using JPL solution 32 with an observation arc of 27 days. As of 9 December 2013, the NEODyS nominal best-fit orbit showed that 2013 TV135 will be 0.75 AU (112,000,000 km; 70,000,000 mi) from Earth on 26 August 2032. An Earth impact would have kinetic energy equivalent to 3,200 megatons of TNT, approximately sixteen times the estimated 200 Mt force of the 1883 eruption of Krakatoa.